Whether you like to go off-roading or you simply live in a region with harsh winters, you will need to know how and when to use your vehicle's four-wheel drive setting. Here's a quick guide that should prove useful. The four-high or 4H setting is ideal for roads that are reasonably smooth and level but may be slippery due to rain, snow or ice. It will allow you to drive close to normal speeds without losing control of your vehicle. The four-low or 4L setting is probably what you had in mind when you pictured four-wheel drive. 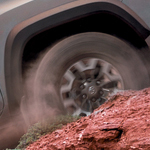 It's intended for difficult terrain such as rocky roads, deep sand, deep snow, mud, and steep inclines. You can't go faster than 40 miles per hour or so when you use it, but it will get you moving when you find yourself stuck somewhere. For more information about how to use four-wheel drive or to have your vehicle serviced, contact Bowman Commercial today.